The service will begin in 2017, officials said. BROOKLYN NAVY YARD — The new Citywide Ferry Service will increase the amount of air pollution at docks around the city, and impacts on air quality will be unavoidable before the project launches next summer, according to a new environmental report released by the city. Nitrogen dioxide emissions from ferry engines could exceed the National Ambient Air Quality Standard, set by the Environmental Protection Agency, at 12 docking sites around the city,according to the draft environmental impact statement that was quietly released by the city’s Economic Development Corporation last month. “Although measures to reduce or eliminate the anticipated significant adverse impacts related [to] air quality have been identified and assessed, full mitigation of the significant adverse air quality impacts is not possible by the 2017 project launch,” the report added. The EDC report says that the nitrogen dioxide emissions would not have a significant negative impact on the city as a whole — and adds that the new transit system would help lower levels of pollutants emitted from other forms of transportation overall in the city. 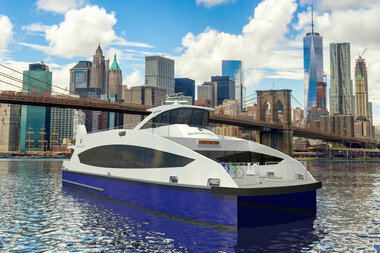 “Citywide Ferry will improve access and resiliency for hundreds of thousands of New Yorkers throughout the city," said EDC spokesman Ian Fried in a statement. The environmental report studied the effects of emissions from ferry engines on pollutant concentrations near existing ferry terminals and proposed terminals, as well as on the total emissions added to the New York City area. Nitrogen dioxide levels would reach more than twice the national standard of 188 micrograms per cubic meter at Gantry State Plaza, a proposed ferry landing in Long Island City, according to the report. Two residential locations near the proposed landing — 45-50 Center Boulevard and 46-10 Center Boulevard — would also see high levels of nitrogen dioxide up to several floors up from ground level, according to the report. While the Citywide Ferry’s new homeport at the Brooklyn Navy Yard is in the clear, high levels of nitrogen dioxide could affect a nearby residence at 1 North Elliott Place in Fort Greene, as well as some industrial buildings on the Navy Yard’s campus, according to the EDC. The study also found that at existing ferry terminals, where emissions were already estimated to exceed the national standard, the new ferry service would spread air pollution across a larger area. Levels of nitrogen dioxide would be about four times higher than the national standard at Brooklyn Bridge Park's Pier 1, where the existing East River Ferry Service and South Brooklyn line of the Citywide Ferry Service would operate with 10 ferry trips during peak hours, according to the report. At Pier 11/Wall Street, nitrogen dioxide levels would reach almost six times the national standard in open spaces and 1 1/2 times the national standard in residential areas, according to the report. Pollutants would spread to buildings located further inland, including residential and commercial buildings, the report says. At Midtown/East 34th Street, nitrogen dioxide levels would reach three and a half times the national standard in open spaces and more than one and a half times the national standard in residential areas, according to the report. Short-term nitrogen dioxide exposure, between 30 minutes to 24 hours, has been linked to respiratory illness in both healthy people and those with asthma, according to the EPA’s website. Studies show a connection between breathing elevated nitrogen dioxide concentrations and increased hospital visits for respiratory issues, especially asthma, according to the EPA. The EDC report says air pollution will be unavoidable in order for the project to move forward, but the city will continue to explore long-term options to reduce emissions from ferry engines, such as retrofitting ferry boats with nitrogen dioxide reduction technology or adding hybrid or all-electric ferries to the fleet. Hornblower, the ferry operator selected to run the Citywide Ferry, also did not immediately respond to requests for comment Tuesday. The mayor’s office announced in March that the first routes of the ferry service, operated by San Francisco-based Hornblower, would launch in June 2017. A ticket will cost $2.75 and at least when it launches, will not offer free transfers to the city's buses or subways. The ferry route includes existing East River, as well as new stops in Far Rockaway, Bay Ridge, the Brooklyn Army Terminal, Red Hook, Brooklyn Bridge Park Pier 6, Governors Island, Grand Street, Stuyvesant Cove, East 62nd Street, East 90th Street, Long Island City, Astoria, Roosevelt Island and Soundview.